Tom developed a love of composing during his late teens and chose to focus his studies at University of Manchester on compositional techniques. He studied contemporary classical composition with Dr Camden Reeves, Prof. Philip Grange at University of Manchester and Prof. Adam Gorb and Gary Carpenter at RNCM. 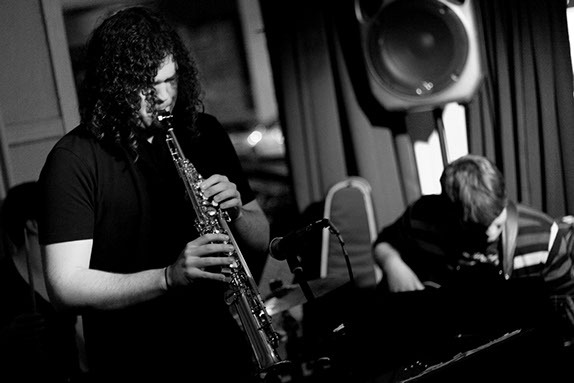 Since then, Tom has written for a number of the UK’s leading young chamber ensembles and soloists, his own projects and commercial clients in Classical/Jazz and Pop genres. He has been shortlisted for several Composition Prizes (Presteigne Festival, John Dankworth Prize, Bucharest Jazz Festvial composers prize) and has been commissioned for a number of large scale works including a recent commission by Howden Minster for the genre-fluid Taka Ensemble as part of their 2016 summer festival. Scores for many of his Original works/arrangements are available for public performance by contacting Tom Thorp directly. Tom has produced a variety of musical content for commercial use. Ranging from Film/TV to theatrical score, from hold music to educational backing tracks. Clients have included: Sainsbury’s, The BBC, Michael Hyde Associated Architect’s, AB Theatre Productions, One Education Trust. Please contact Tom directly if you want to discuss studio produced or instrumental commercial briefs.